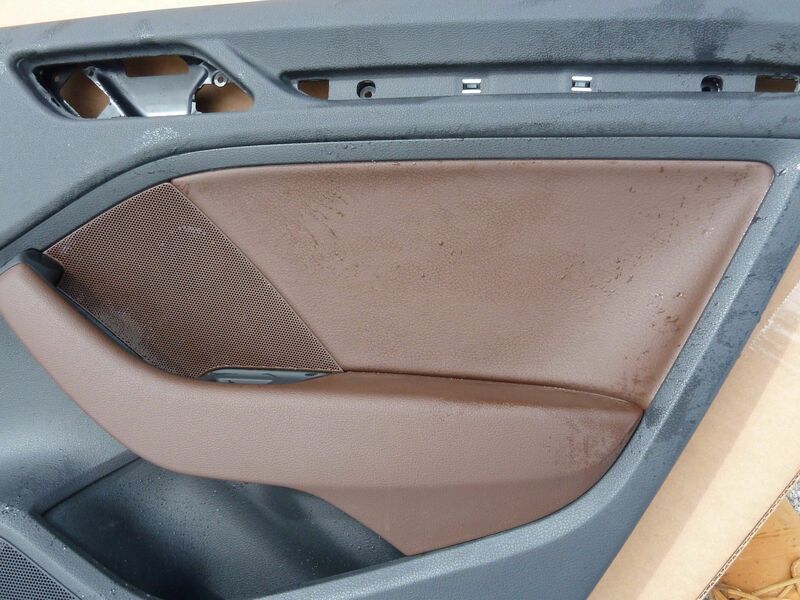 Anyone have any pics or suggestions on how to remove the rear door panels on 2017 S3 sedan? I saw a post for the fronts, but not the rears and want to make sure I get all the screws before trying to pull on the panel. In case you are wondering why I am doing a custom trim upgrade and want to pull the aluminum pieces off. 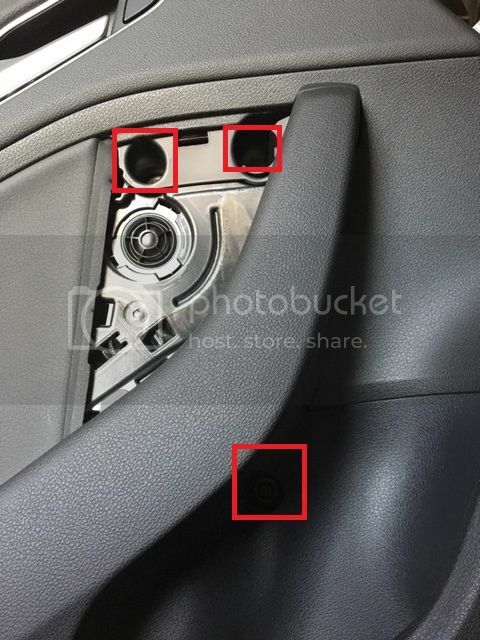 I found some photos on eBay that may help you locate the screws. Also here are some video for the fronts. Thanks man! Still a little hard to line it all up but will take pics out to the car with me and hopefully that will assist in tracking down the locations. Appreciate your help!!! Are you swapping out the speakers? Nope just pulling the aluminum trim off the door panels. 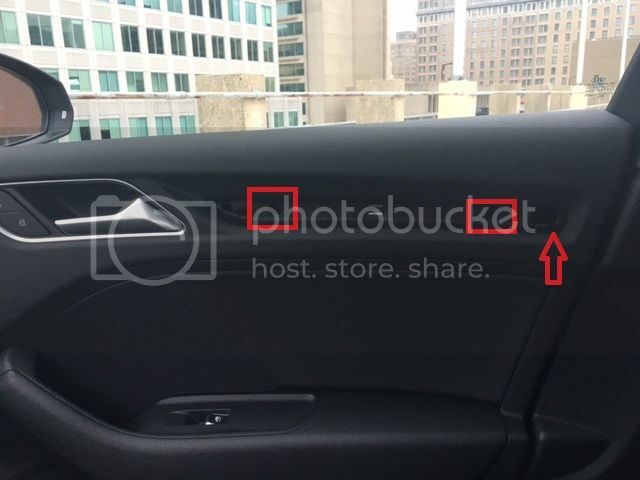 Looks like the trim on the door just pops out? The dash yes, the doors no. There are definitely screws holding them on. I will mess with it this weekend and probably take a few pics and do a quick write up to assist anyone else with this as I cant find anything clear cut on the net or forums. I find little piece of info here and there but not an easy to follow all in one spot. You will need T20 to remove the 2 screws on each piece of trim on all four doors. For the dash insert the radio removal keys into the two slots on the multiswitch unit. Push until it clicks. Then pull both tools out evenly and the unit slides right out. Get a long thin screwdriver wrap in painters tape and stick behind all three dash pieces and they will pop off. On to the doors which will take the most time. Take the small trim tool and put it in the top corner of the plastic speaker cover and pop it off. 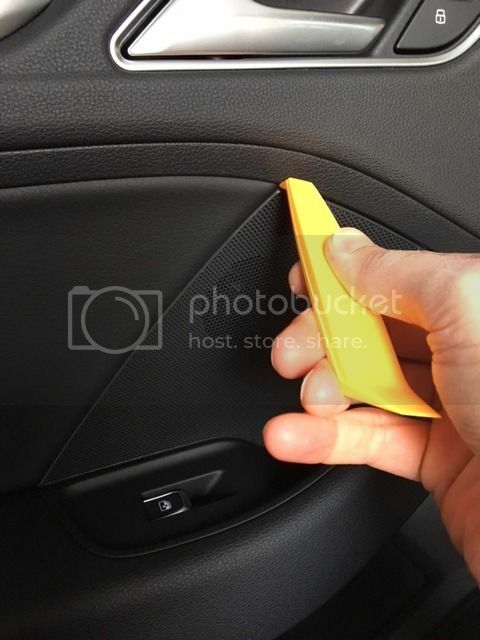 Take the bulkier trim removal tool and put it in the far outside corner of the door panel. Pry it lightly until you get fully behind the panel, then use a little muscle and get your fingers in there, you will hear a loud pop. Once you get that rivet out, slide the tool along the bottom of the door until you find the next one and do the same thing. Do this until you can get both hands behind the panel and then pull. When you get to the top you have to lift the door panel up (I rolled down the windows making this easier). You can see the green speaker wire in the pic and you can remove that if needed if you dont have enough slack to get the two T20 screws holding the door trim on. 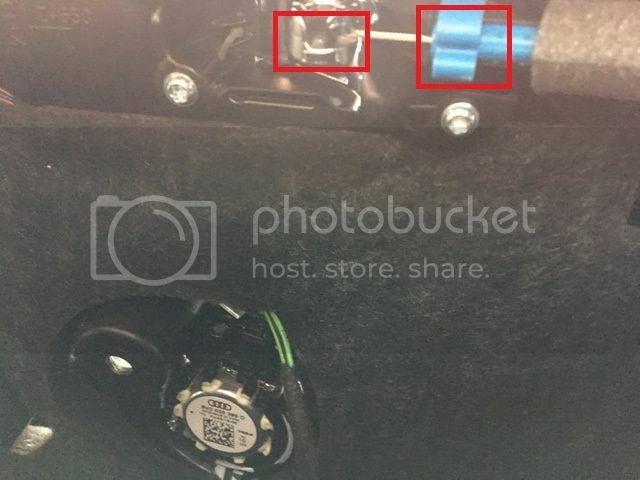 In the picture below I have boxed off the locations of the two screws. 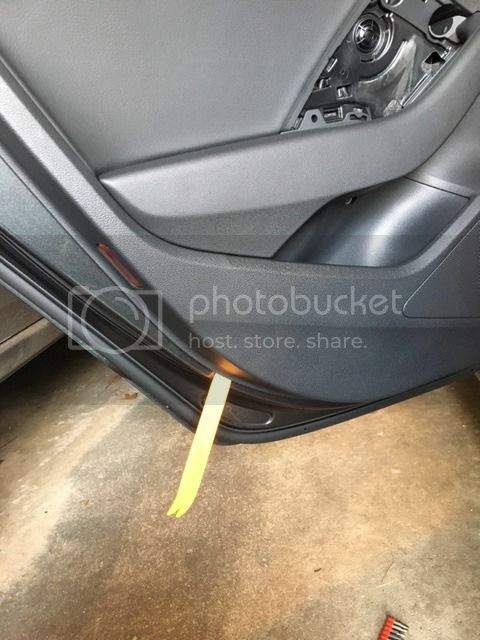 The arrow points to an open space that you can stick your screw driver in and push on the back of the trim to help pop it off the door panel. Makes it alot easier then trying to use the trim tools to pry the trim off the panel. From the back just sick a screwdriver in that hole, push and it will push the trim right off and it will fall into your hand... dont push too hard or it will fly off! Hope this helps someone else out, was a bit of a pain tracking it all down... in hindsight I should of just went out to the car and did it, spent more time researching then it was worth as it wasnt too hard... though the radio remove keys are money for helping get the dash pieces off much much easier! Will post pics of my new trim in a few weeks once I get it back from the fabricator! Thanks for the great write up. Did you have any trouble putting things back on (I have read a few stories about difficulty with the door handle cable)? Also - did you ever post your final build? there is a video that will kind of help you. 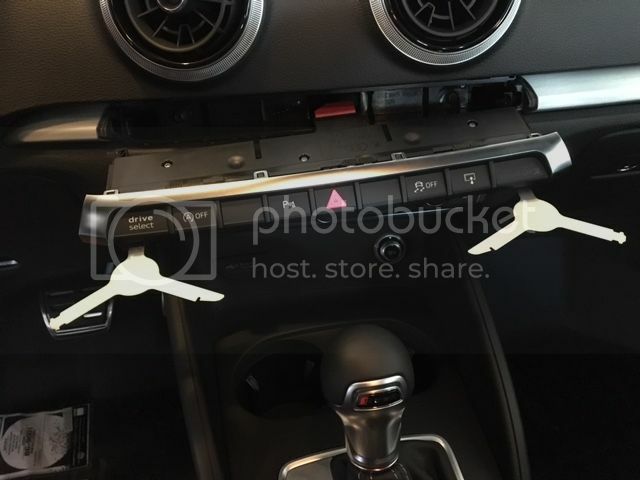 i will be making a video on how to remove the panels on a 2017 audi s3. i am tinting one in 2 weeks and want to make a video for my channel. it doesnt show any screws under the aluminum piece like the A3 models.